We are all prisoners of knowledge. To know how Cyprus was betrayed, and to have studied the record of that betrayal, is to make oneself unhappy and to spoil, perhaps for ever, one's pleasure for visiting one of the word's most enchanting islands. Nothing will ever restore the looted treasures, the bereaved families, the plundered villages and the groves and hillsides scalded with napalm. Nor will anything mitigate the record of the callous and crude politicians who regarded Cyprus as something on which to scribble their inane and conceited designs. But fatalism would be the worst betrayal of all. The acceptance, the legitimization of what was done - those things must be repudiated. Such a refusal has a value beyond Cyprus in showing that acquiescence in injustice is not 'realism'. Once the injustice has been set down and described, and called by its right name, acquiescence in it becomes impossible. That is why one writes about Cyprus in sorrow but more - much more - in anger." 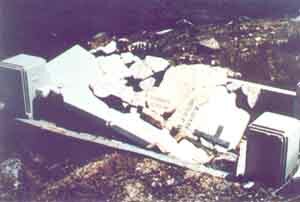 Below we list a few examples of the organized, systematic, and state sponsored terrorism effort by the Turkish State to fully destroy and vanish every sign of Greek Orthodox Christianity from the occupied areas of Cyprus, with a long-term goal to change the ancient history of Cyprus that will pave the way for total capture of Cyprus in the future. Click on image to see the enlargement. 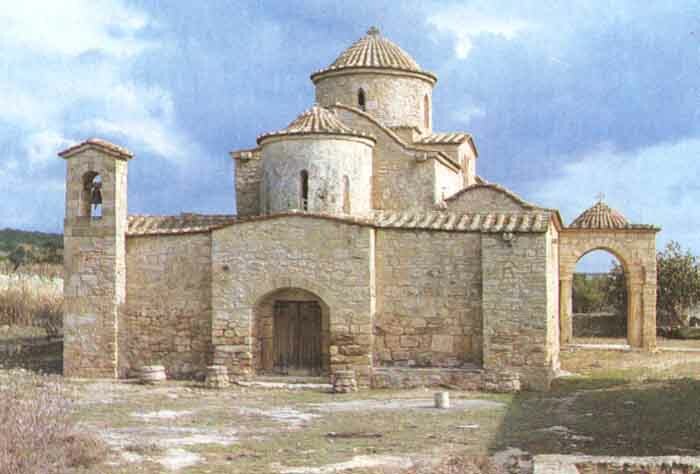 The Greek Orthodox Christian church of Holy Mary of Kanakaria in Lithragkomi village, Karpasia peninsula, Cyprus, with a very rare type of Byzantine Art of the 6th century A.D. The mosaics included Virgin Mary, that was holding Christ on her knees. 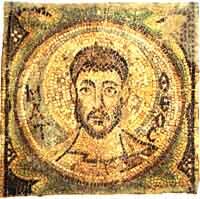 The mosaics also included the four Apostles. 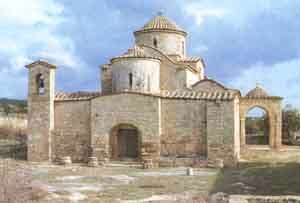 The church had been totally looted and destroyed in 1979 by the Turks. 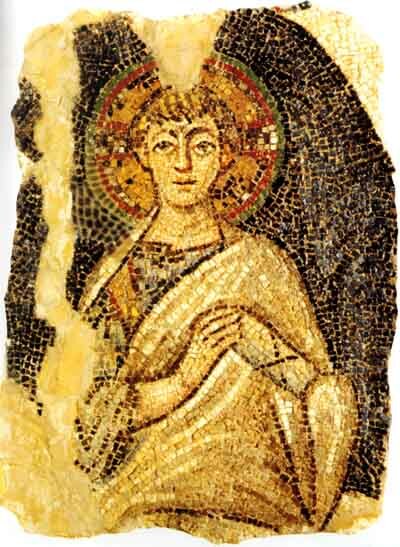 Only a few chops of mosaics were found on the floor, which were returned back to Cyprus government authorities by foreign reporters that visited the area. 1. Hellenic Canadian Association of Ontario. 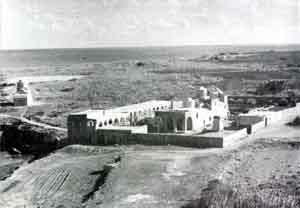 Right: The Greek Orthodox Christian church of Holy Mary of Kanakaria in Lithragkomi, Karpasia peninsula, Cyprus. 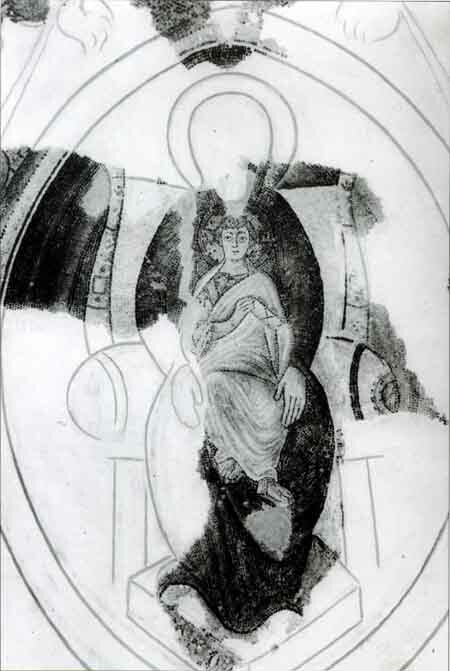 Virgin Mary sitting on her throne, inside a glory of light, is holding Jesus Christ on her knees. 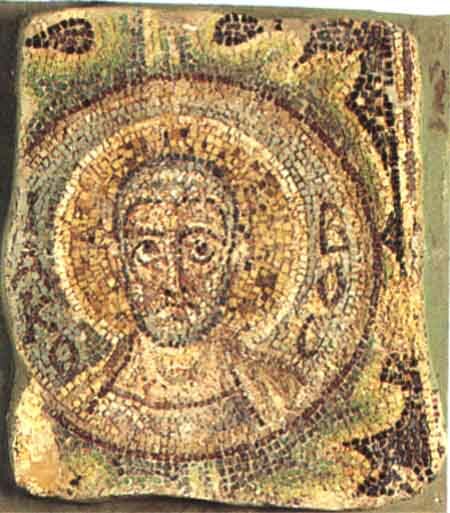 Central view of the mosaic that has detached and sold in black markets by the Turks. 2. Press and Information Office - Cyprus. Left: Part of the mosaic of Virgin Mary and Jesus Christ. 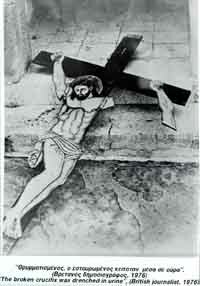 It was discovered in Indianapolis, IN USA after the church was looted in 1979. 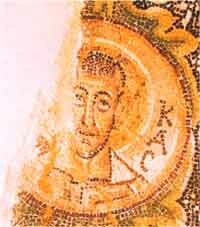 It was returned back to Cyprus in 1991 after a legal battle. It is now on display in the Byzantine Museum of Archbishop Makarios C Foundation, Nicosia Cyprus. 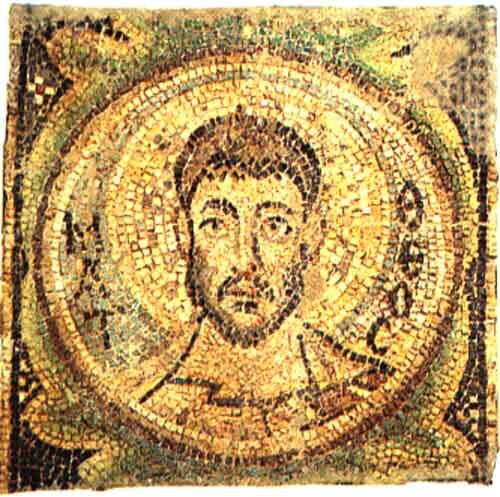 Upper Left: Mosaic of Apostle Thadeos. Photo shot after its return from Monaco to Cyprus in 1997. 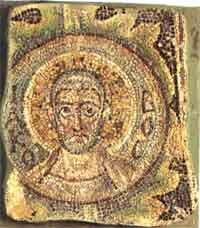 Upper Right: Mosaic of Apostle and Evangelist Mathew. Photo shot after its return from Indianapolis IN, USA to Cyprus in 1991. Below Left: Mosaic of Apostle Jacob. Photo shot after its return from Indianapolis IN, USA to Cyprus in 1991. 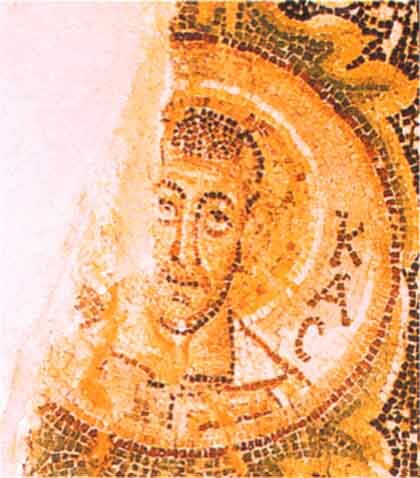 Below Right: Mosaic of Apostle Loukas. Returned to Cyprus via Germany in 1993. 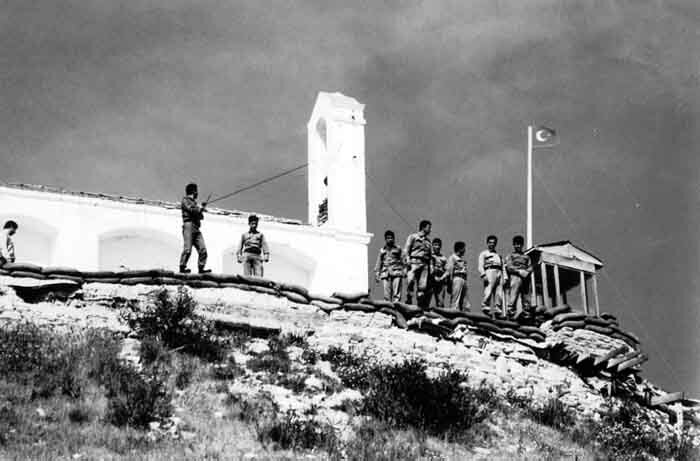 Photos like the one on the left are some of the atrocities of Turkish invaders against Greek-Cypriots, and against any Greek Orthodox symbol of Christianity in the 37% of occupied Cyprus. In the photo, Crucified Jesus Christ is thrown on the floor drenched in urine by "European Turks". 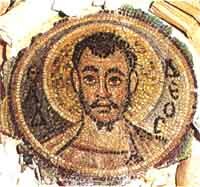 Turkish Muslim Mongols show no respect not even for Holy Religious Symbols of Hellenism and of Christianity. The Turks, methodically and systematically destroy everything that is Greek in the occupied areas of Cyprus, (Greek Orthodox Christian Churches, Greek orthodox monasteries, Greek cemeteries, Statues of Greek Heroes, etc.) while at the same time they sell in the black market Greek archaeological treasures of unprecedented value. The face of oppression in its zenith. 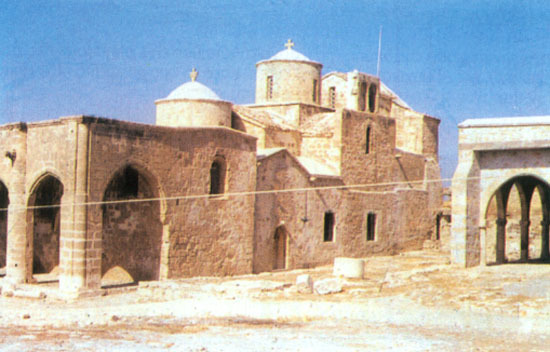 The Greek Orthodox Church of The Holy Cross at Lympia village on the boundaries of the cease-fire line in Cyprus. 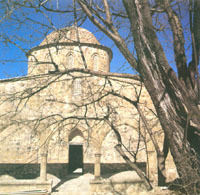 The Greek Orthodox Church of The Holy Cross is located on the top of a hill above Lympia village, and is used by the Turkish army as observation post, and for weapons and ammunition depot. Lympia village which is on the bottom of the hill is under the control of the Cyprus National Guard. 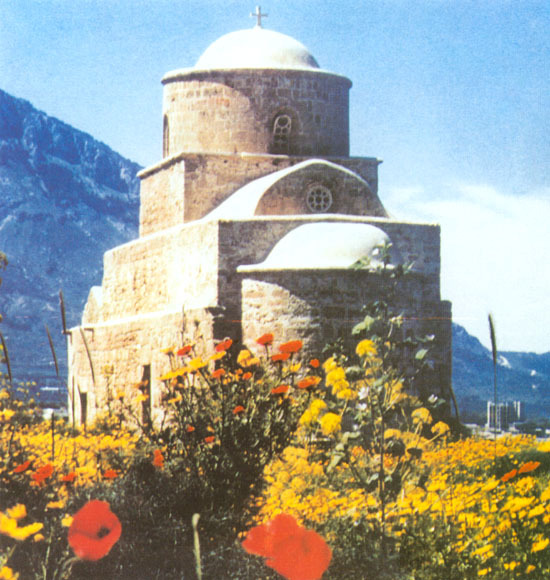 The Christian Greek Orthodox monastery of Holy Mary Acheropoiitos and the Greek Orthodox chapel of Saint Evlalios next to the Kyrenian sea and between the villages of Lapithos (Lambousa) and Karavas. The Greek Orthodox monastery of Acheropoiitos is used by the Turkish invasion army as a military camp, whereas the Saint Evlalios chapel was used until recently as an ammunition depot. 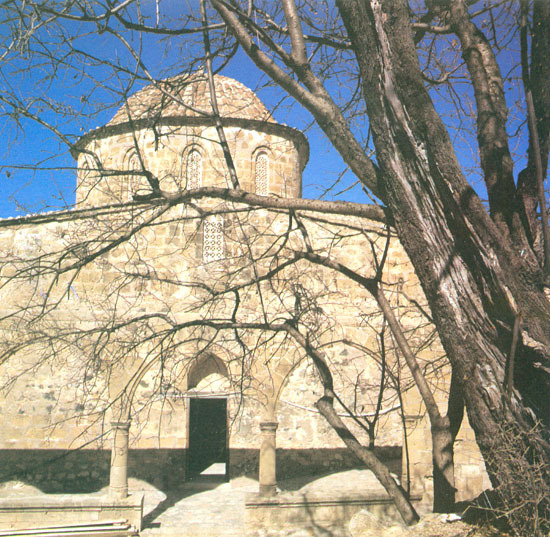 Recent information revealed that the Turkish military have demolished the chapel of Saint Evlalios. Turks methodically and systematically are destroying all Greek cemeteries from the entire occupied part of Cyprus in an attempt to extinguish all signs of Hellenism and Christianity from the occupied areas of Cyprus. 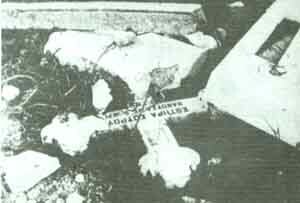 In the photo you can see a destroyed grave with broken cross at Yialousa village, in Karpasia, Famagusta district Cyprus. Click here for a website about occupied village of Assia. 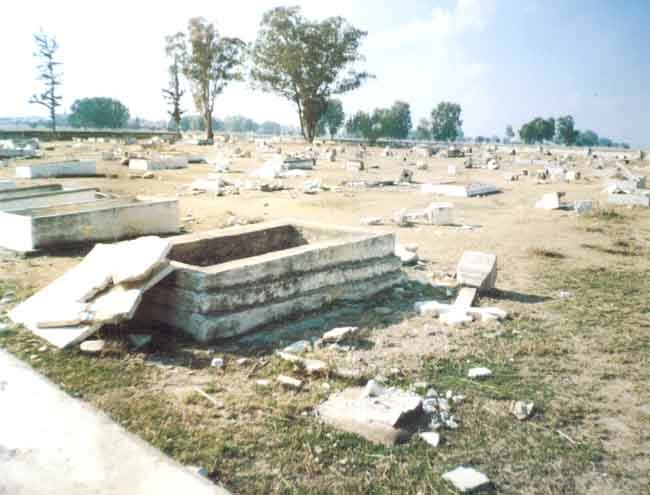 In the photo on the left you can see the Greek cemetery of the village. 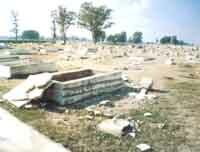 Open graves, broken crosses and thrashed tombstones. Assia is one of the villages that suffered proportionally the greatest number of victims, both killed, and missing as a result of the 1974 Turkish invasion against Cyprus. In the photo on the right you can see the Greek cemetery at Thermia village in Kyrenia district, after the vandalisms caused by the Turks. 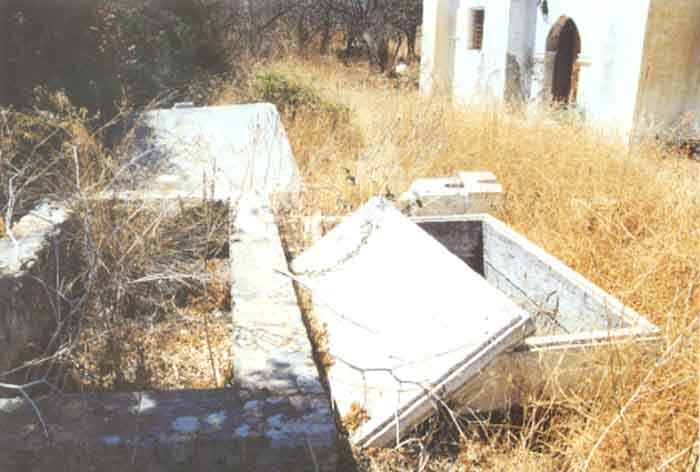 Almost ALL Christian cemeteries in all villages and towns in occupied Cyprus have been ruined and destroyed in an organized fashion by the Turkish occupation regime.